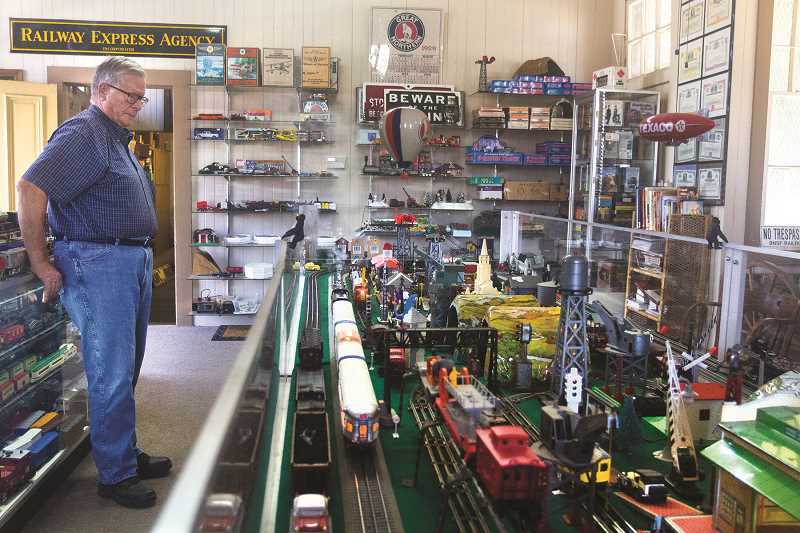 A hobby shop in the Mount Angel train station keeps the town's railroad past alive. A deep horn blast heralds the arrival of a clanking train, steam puffing from the engine's chimney stack. The locomotive pulls into a station, a station made of plastic and about the size of shoe box. The train is one of many model locomotives on display at the Mount Angel train station, a faded yellow building at the intersection of Railroad Avenue and North Main Street in Mount Angel. The building is owned by Mount Angel resident Al Ketchum, who bought the station in 1990 when Southern Pacific planned to run a freight and tourist line down to Stayton. Ketchum had the idea of serving trains as they passed through town, but Southern Pacific went out of business in 1998 and his plan fell through. Ketchum held on to the station though, operating it as an antique and hobby shop with his wife while his two daughters ran a hot dog stand out of a shop window. "It was just fun. Still is," Ketchum said. Now he runs the station as a toy store, open every Friday. Model trains were a hobby passed down by his father when he was a kid, Ketchum said. He still has one of his father's model trains from 1923 on display at the front counter. "We like to keep them running," Ketchum said, as a passenger line click-clacked past. Most of the models on display are from the '50s or earlier, a mishmash of toys in different scales. He doesn't bother with making the track look realistic, just fun. "That's what it was like when we were kids," Ketchum said. Ketchum actually owns his own steam engine, which is fully operational and carries tourists from the Port of Tillamook down the Cascade Scenic Railway. The engine is painted black and white like a Holstein cow. 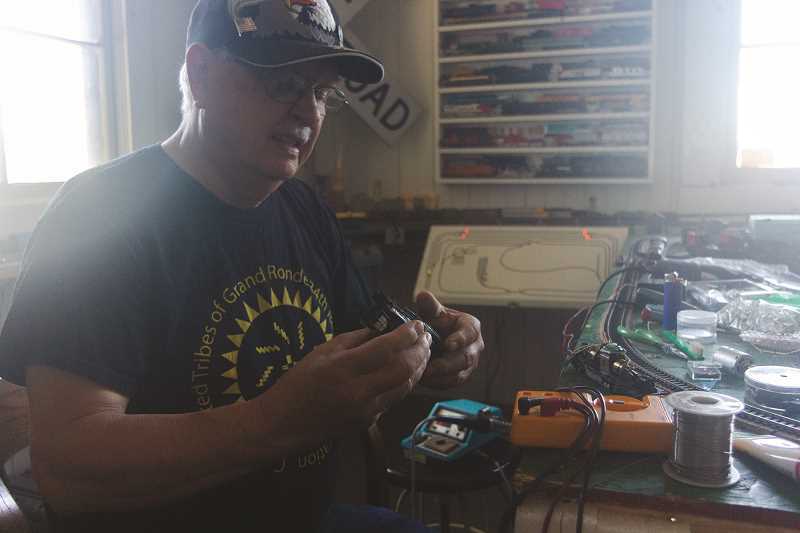 Ketchum's friend and fellow train hobbyist Al Miller was working on the electrical guts of an N gauge model of Ketchum's engine last Friday. Miller, a retired Navy veteran from Silverton, has been spending Fridays at Ketchum's shop for about five years. Miller said he popped his head in one day to check out the station and was soon bringing in his own collection of trains and tracks. Miller got into trains as a kid too. "I was 10 years old, my dad bought a locomotive made out of pot metal. I had to clean the flashing, paint it and put the track together. It still runs," Miller said. Miller builds N gauge tracks, smaller than Ketchum's HO models, around paint and paper mock-ups of towns and mountains. He reckons he'll be finished building a model town in the corner of the station by 2075, at the latest, he laughed. "It's just one of my hobbies. There's nothing particularly special about it, I just enjoy it," Miller said. Mount Angel grew up around the railroad. Before the Mount Angel Abbey was built the town was named Roy, and before that Fillmore for a railroad official. The founder of Mount Angel Abbey first saw the hill where the abbey now sits while traveling through on a train. 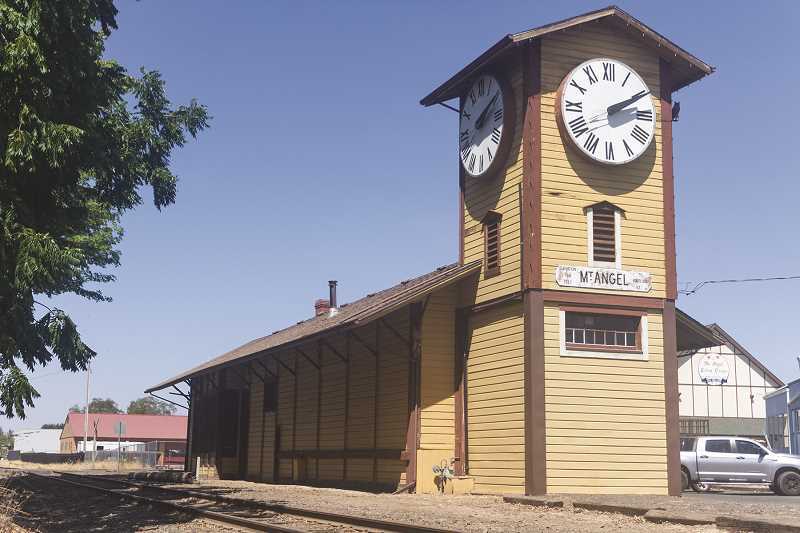 The old railroad depot was located about where the Mount Angel Festhalle is, and Railroad Avenue was Mount Angel's main street before Main Street was built in 1964. The train station was built in 1882, the same year the abbey was founded, assembled from pieces brought on a flatcar. It has the same floor plan as the old train station in Canby, with one difference: a two-story clock tower. Former owner George Schmidt built the clock tower in 1976 to house a clock salvaged from Salem City Hall, which was torn down in 1971. The clock predates City Hall, and was originally installed in the Marion County Courthouse in 1873. Ketchum sets the motor for the clock about twice a year. The gears and hands keep turning and ticking, slowly circling the clock face like the trains rounding the tracks beneath them.